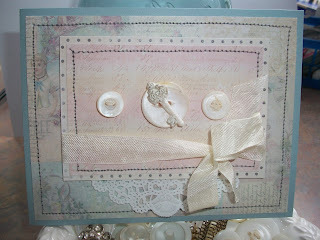 With Christmas just around the corner and me recovering from gallbladder surgery this week I have had a little down time, so I decided I could create a simple shabby chic card for this weeks MoJo Monday. 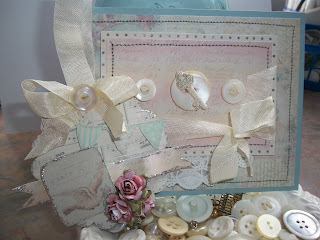 Of course I knew I had to use the 5th Avenue by Melissa Frances love this paper line, added some vintage seam binding and mother of pearl buttons. A little sewing around in grey thread gives this card a little pop! 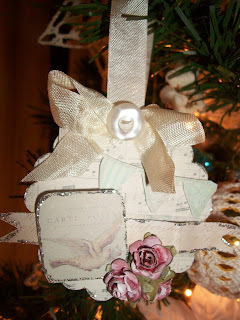 Along with the card I knew I had to create a little ornament to adorn our tree with the 5th Avenue papers, it turned out so cute I created a few more for Christmas gifts.